"And who could our new challenger be... Oh my word, it's none other than Springtron! He's the ultimate fighting machine who's been disrupting the Grand Prix seeking worthy opponents. Leveraging a lifetime of ARMS Lab's historical data, he's machine learning—and fighting—at its finest." Springtron is a playable fighter in ARMS. He became playable in the Version 4.1.0 update, though he was in the game as an unplayable boss since Version 3.2.0. Springtron was modeled after Spring Man, and as such looks quite similar to him. He is made of grey metal, has glowing blue eyes with black sclera, spring-like ARMS modeled after Spring Man's, and metal "hair" which is bent to resemble Spring Man's. He wears a mask similar to that of a human fighter, and a mouthpiece not shared by Spring Man. His outfit is identical to Spring Man's, except in his signature black and red color scheme. Just like Spring Man, his chestplate prominently features his logo, which is modeled after a T instead of an S.
"A lean, mean fighting machine designed and built by ARMS Labs! His metal body is inspired by the popular fighter Spring Man, and he's packed with the latest advances in fighting technology. With the goal of improving ARMS Labs's image by flexing their scientific muscle, he's finally been allowed to step out of the shadows and officially enter the Grand Prix!" According to one of Biff's messages when fighting Mechanica during the Grand Prix, Springtron may have been built using blueprints stolen from Mechanica during a failed attempt at discovering her weakness. Similar to Spring Man, Springtron is able to deflect incoming attacks with a small shockwave by charging after a dash or jump, and releasing the button before he is fully charged. After a full charge, he rises from the ground and emits a huge shockwave that disables any extending arms within its range. During his descent, he also has a smaller, lingering "bubble" around him with the same effect. After this, his arms will stay constantly charged and his dash distance and speed will be boosted greatly. This effect lasts for approximately 9 seconds, or until he is knocked down. In exchange for these benefits, Springtron lacks Spring Man's permanent charge at 25% health, and his speed both on the air and the ground is lower due to him being made of heavy metal. "A-am I hallucinating?! Do we have an…intruder? I've never seen anything like this, folks! … I don't know about you, but I smell something fishy goin' on here. We gotta take this guy down!" Springtron is a secret boss in Grand Prix mode, fought immediately before Max Brass or Dr. Coyle. To encounter him, the player must play through Grand Prix on at least Level 4 or higher without losing a single round. The player will only have one chance to defeat Springtron, after which they will be taken directly to the Grand Finale. He has the same ARMS, stats, and deflect shockwave of Spring Man, but instead of gaining permanent charge at 25% health he is capable of unleashing a large electric field after fulling charging. This electric field disables arms you have out, and gives him constant charge and dramatically increased movement speed for approximately ten seconds unless he is knocked down in which case this effect disappears. Springtron is significantly stronger as a boss then he is as a playable character, boasting increased movement speed both with the buff and without, and only taking half a second to activate his shockwave as opposed to the full second needed when playing as him. The noticable advantage is he always do a start-up charged state before each round begins. ▲ Specs improved thanks to a certain girl genius! Movement during a super charge has been greatly increased. ▼ He’s a little heavier now, but that’s fine! Movement speed for normal jumps has decreased. appreciates your loyalty 60 Play as Springtron 50 times. Springtron! You're a machine-literally! 200 Play as Springtron 500 times. look so sad... 100 Defeat Springtron 100 times. ARMS Labs starts studying YOU now! 200 Defeat Springtron 250 times. Springtron really paid off. 30 Choose Springtron in the fifth Party Crash event and reach level 5 (no longer obtainable), or get it randomly from the random badges (levels 15-30) obtainable in future Party Crashes. in the 5th Party Crash? Springtron would be so proud. 30 Choose Springtron in the fifth Party Crash event and reach level 10 (no longer obtainable), or get it randomly from the random badges (levels 15-30) obtainable in future Party Crashes. in the 13th Party Crash! Nice work, Springtron! 30 Choose Springtron in the thirteenth Party Crash event and reach level 5 (no longer obtainable), or get it randomly from the random badges (levels 15-30) obtainable in future Party Crashes. Way to be, Springtron! 30 Choose Springtron in the thirteenth Party Crash event and reach level 10 (no longer obtainable), or get it randomly from the random badges (levels 15-30) obtainable in future Party Crashes. Spring Man vs. Springtron! 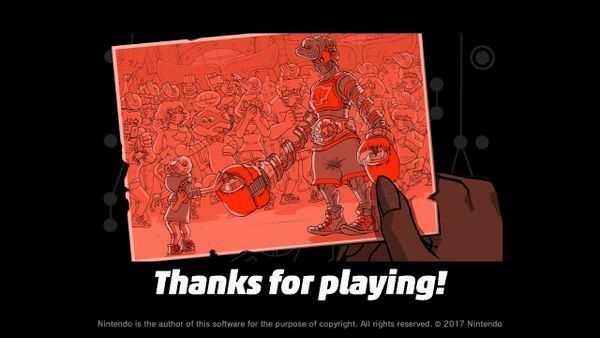 60 Participate in 1-on-1 matches between Spring Man and Springtron adding up to a total of ten or more rounds. Springtron vs. Helix! 60 Participate in 1-on-1 matches between Springtron and Helix adding up to a total of ten or more rounds. one of Dr. Coyle's groupies? 30 Defeat an opponent using Springtron equipped with the Lokjaw on at least one ARM. Grand Prix. Nothing fazes you! 200 Defeat Springtron in Grand Prix mode. and won the Grand Prix as Springtron! 200 Defeat Springtron in Grand Prix mode and beat Round 10 of Grand Prix with Springtron. Note: Springtron shares his quotes with his Spring Man. Springtron is the youngest ARMS character, at 0 years old. The second youngest is Helix, at 2 years old. When Springtron gets new ARMS, the same ARMS are available for Spring Man, and vice versa - When Spring Man gets new ARMS, the same ARMS are available for Springtron. 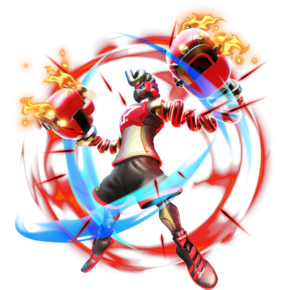 Springtron fits the typical fighting game trope of a clone character, sharing most of his abilities, attributes, animations, and even quotes with Spring Man. This page was last edited on 22 February 2019, at 23:02.